« Fergie Gets Stylish with a Sash While Out Christmas Shopping, Hit or Miss? A black scarf is probably the most common accessory in anyone’s closet (even a guy’s closet). It’s a staple, it’s a classic, and yes, it can be boring too. But like we said before, there are several ways you can style it to make it look more interesting. Cher Lloyd played with textures, and we also showed you 3 other easy tricks courtesy of some very fashionable bloggers. Today, we’re giving you a couple more suggestions on how to style a black scarf. This time, however, we’re taking notes from Cara Santana, the future Mrs. Jesse Metcalfe. As you know, Cara is no stranger to fashion. Generally speaking, the actress always looks good, both on, and off the red carpet. This month, Cara really caught our attention with the way she styled a a single black neck warmer in two really fresh, cool, and totally non-boring ways. If you’re drawn to black or white (almost always involuntarily), try mixing your scarf with black-and-white printed or patterned separates. This will make your scarf stand out. It will be a very catchy combination too, so you can tone it down by topping the whole ensemble with a black coat (a la Cara here). With look-at-me separates (ergo, flashy pants or flashy top), your accessories need not be loud. But they do need to be fantastic and awesome (and in the same color palette). In Cara’s case, her black sunnies were very reminiscent of Audrey Hepburn’s sunglasses in Breakfast at Tiffany’s. And then of course, who can miss those super-cool silver-trimmed oxfords on her feet? Those borrowed-from-the-boys lace-ups seriously rock. Would you agree? Another look to try is to go sporty and preppy all at once by wearing your black scarf with ripped blue boyfriend jeans and a two-tone varsity jacket. To infuse a little bit of preppy drama, fold up your jeans and work a pair of (really cool) oxfords — which is exactly what Cara did with her look below. If you’re not into loose denim, skinny blue jeans with your black scarf will do fine as well. Pair the combination with Superga sneakers, then top the whole ensemble with a two-tone varsity jacket. It’s a more laid-back take but just as fun. So which of these black-scarf looks from Cara would you be willing to try first? You will probably find the first one tricky because of the patterned pants, but the second style is definitely easy to pull off. 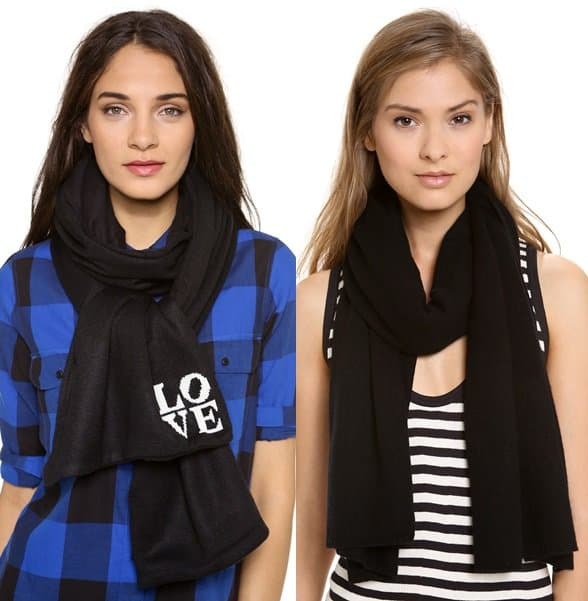 For fresh black scarves to grab, we recommend these pieces from Plush and Bop Basics. The former is really cute because it has the word “LOVE” written on it. The latter is a cashmere piece that will go with just about anything. Simply take your pick!